In the applet below, transversal n intersects the lines g and i. Interact with the applet below for a few minutes. Then answer the questions that follow. 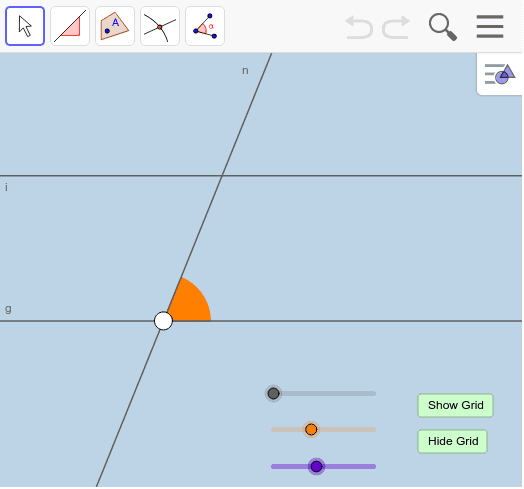 Use the Slope tool to measure the slopes of the two lines g and i. What do you notice? What does your observation from (1) tell you about lines g and i? If you haven't done so yet, drag the white point along transversal n as far as it will go. What geometric transformation is taking place? If a transversal (in this case, n) intersects 2 lines that have the property that you wrote in response to (2) above, what can you conclude about the pair of orange corresponding angles that were formed?